What is the difference between the professions of the Shahrukh Khan version of Don vs. the earlier one essayed by Amitabh Bachchan? The original Don was a gold smuggler while the new one pushes drugs – quite a subtle generational shift this and very much attributable to the lifting of the import duties on gold in 1992. The yellow metal had flowed in freely once the shackles were removed. The differential between the Indian price of gold vs. the UAE one reduced to a level so as to make the risk weighted returns of smuggling very low indeed. Ergo, the villians in Hindi films underwent an apt metamorphosis. Even ertswhile smugglers gave up their shady coves and wharfs and took to politics. But the smuggling never really died down – it continues to this day and the recent budgetary proposal to increase the basic customs duty on gold imported into India will certainly do its bit to not only revive this old cottage industry but also bring the old Bollywood villian out of his holster. Even godmen have dipped their toe in the pool – Swami Nityanand’s name has been doing the rounds it is said. It’s a good thought, according to what I have read and understood provided that the authorities (read customs, BSF, RAW, etc) can lift up their game to apprehend all worth appprehending – it could turn out to be good for the economy in the longer run. They are saying that China looks all set to overtake India as the world’s largest consumer of gold – if the logic of the customs duty hike is bona fide, then this is one race which we’d be better off letting China win. As such China beats India nearly everywhere anyways. 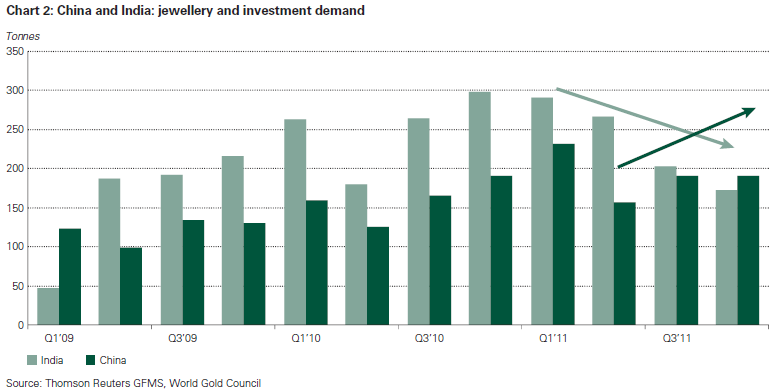 The chart alongside (via World Gold Council) hints at this. From the country’s viewpoint, gold holdings, are no different from foreign exchange reserves really – despite the fact that a huge chunk of India’s gold is in private hands and therefore cannot be mobilised easily if required to serve for national duty. Which is why the move to curb gold consumption (and therefore gold imports) by raising customs duty makes sense. We consumed 1,000 tonnes of the yellow metal in 2010 and another 933 tonnes of it during the next year! While it is clear that the current risk aversion trade and low tariffs have been responsible for this influx, the taps have been flowing all through the 70s and 80s – via the surreptitious route. Today, gold is now officially the most smuggled item to India having pipped television sets to the post. Which is why the government came out with a couple of gold mobilization drives to shore up the foreign exchange reserves. If this is the method that the planners of the economy are betting on to control the trade deficit, then I am guessing that sometime in the future we will see another issue of these gold swapped bonds/gold mop-up drives. Lets see. Remember, RBI had bought 200 tonnes of gold from the IMF sometime in late 2009. I guess they won’t be needing to do that anymore. The notion that the national stock of gold can indeed be considered as a proxy reserve of foreign exchange currency reserves is buttressed by the fact that India recently purchased oil from Iran using gold. 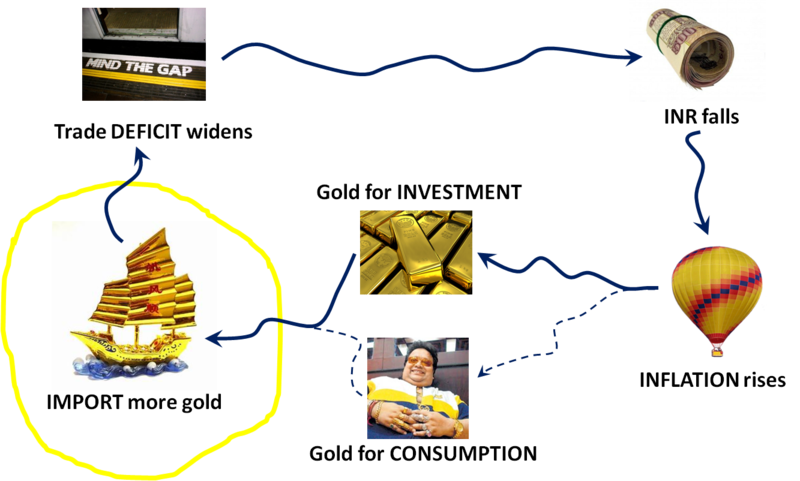 Did you know that nearly a third of our current trade deficit is due to our purchases of gold. The government, via two customs duty hikes in quick succession, is hoping to provide an external stimulus that helps the economy to break out of the current gold – inflationary cycle. The customs duty hike works in the import stage which is circled in yellow in the picture alongside.